So, I assume you wish to explore the mystical beauty lying twenty thousand leagues under the sea this holiday. Want to know what are the most beautiful coral reefs in the world? Craving for a dream-like snorkeling or scuba-diving experience? Read on and you won’t be disappointed. The coral reef isn’t a cluster of rocks although it looks like one. In reality, they are a fascinating marine ecosystem, covering roughly 2% of the ocean bottom. Coral polyps are the members of Cnidaria, a type of sea anemone. Their tentacles are armed with tiny, stinging cells (scientifically known as nematocysts) that help the corals to catch the microorganism swimming close to them. Most tropical coral reefs are formed of these polyps held together by calcium carbonate. Reefs are colonial in nature, the more the numbers of colonies in a reef, the bigger it is. The Great Barrier Reef in Australia is so massive that it can be seen from space! It takes thousands of years to form a medium-sized reef as corals grow very slowly. 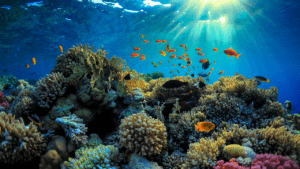 Coral reefs are found only in the oceans of tropical and subtropical regions. However, deep sea corals can survive in cold water too, almost 20 thousand feet under the sea where the sunlight cannot reach. Coral reefs are the shelter for millions of aquatic species including thousands of fishes and sea turtles. Coral polyps need clean water to thrive and sustain. Do not litter trash in the beach or in the water. Polluting the ocean means plotting a murder for the entire wildlife breathing under it. If you really care for coral reefs, join a beach-cleaning campaign in your town or city. Corals are not cute pieces of stones. Many snorkelers and scuba-divers, in their quest to collect souvenirs, break off chunks from the reef. This is a very immoral act to do. Always observe the corals from a certain distance, take pictures, behold the grandeur of this exquisite ecosystem but do not try to touch them. Don’t land your boat near a reef intentionally. If you can’t help it, use a buoy instead of an anchor as the latter might leave scars on the reefs. Out there in many countries, coral souvenirs are in huge demand. People are ready to splurge their cash to rope in such collectibles. This increasing demand has encouraged the traders to destroy the coral reefs in bulk. Say no to buying or even accepting coral souvenirs. Do your bit to save this underwater marvel. If you haven’t heard of the Great Barrier, you’re probably living under the rock (the pun was entirely unintended). 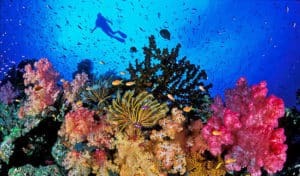 Being the largest coral reef in the world, it is regarded as one of the seven natural wonders of the world of all time. It was declared a world heritage site in 1981. Stretched across 1800 miles across the Queensland coast, it is the only form of life visible from the space. 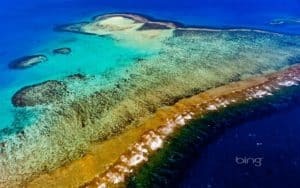 It is larger than UK and Ireland combined, it will take several days of boat travel to explore the remote areas of the reef. The Great Reef is a house to more than 1500 species of fish along with exotic creatures like sting rays, sharks, lobsters, sea turtles and many more. The span between March-August is said to be the best time for snorkeling and diving. Raja Ampats is also known as The Heart of Coral Triangle. Four main islands: Batata, Salawati, Misool and Waigeo collectively form one large coral reef that spans across 15000 square miles of the northwestern coast of Indonesia. 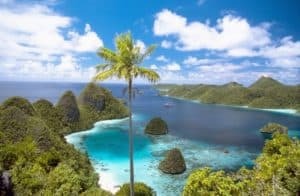 Raja Ampat boasts of housing 1200 species of fish and almost 600 species of hard coral. In fact, the biodiversity of this reef is the highest in the world. 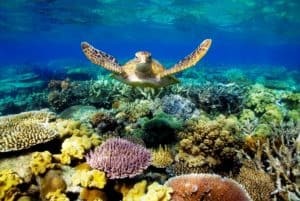 Marine scientists have also discovered that this coral region is responsible for producing and outsourcing a staggering number of coral larvae to the Indian and Pacific ocean. The remote areas of this island aren’t easy to reach, but the scenic beauty is worth every bit of the effort you’ve to put. People can dive here all the year round. Maldives have been one of the most explored coral reefs in the world. People from various corners of the Earth come to Maldives to gaze at this underwater magnificence in awe. Maldives has the world’s largest atoll (ring-shaped coral reef). The Maldives-Chagos-Lakshadweep Atolls are a collection of almost 1300 islands and sand banks located near the equator. It provides shelter to rare and exotic creatures like the finless porpoise, Blainville’s beaked whale, manta rays, eagle rays, whale shark and hundreds of sea turtles as well. Out of the many atolls, Ari Atoll has the greatest display of aquatic wildlife. All though the diving session goes on all the year round, I’d suggest a visit between December-May as the sky remains blue and the sea calm. New Caledonia Barrier Reef is a paradise of diverse biological species. Expanded over 900 miles, it is one of the primary nesting sites of green turtles, half-extinct species of crab and endemic mollusk. The crystal clear South Pacific ocean is a delight to both eyes and mind. If you love bird-watching, let me inform you that every year, 23 species of marine birds such as Brown Noddy, Sooty Tern visit here. On a sadder note, rapid coastal development in the last few years, frequent cyclone floods, and heavy sedimentation in lagoon areas are affecting the marine life at an alarming pace. You can go for snorkeling and diving here at any time of the year. Belize is the second largest coral reef system in the world and is spread over 180 miles off the coast of Belize. 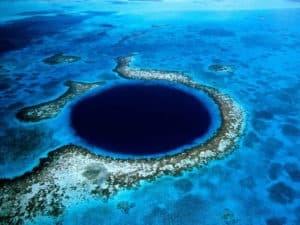 The Great Blue Hole of Belize is widely popular as the diving spot for hammerheads, the mighty nurse sharks, and black tip sharks. Dive into the magical world of 300 diverse species of fish and more than 65 variants of coral with a new species getting discovered every year. The ideal time to discover Belize would be April-June.